With SQLyog you can enjoy a great feature of multiple editor tabs in the SQL window. You can open several files at the same time and logically separate your queries between the tabs. Press Ctrl+T to open a new SQL editor tab or just double click in the unused space to the right of existing open tabs. Focus can be changed between editor tabs using Ctrl+Page UP and Ctrl+Page Down buttons and the active editor tab can be close with Alt + L.
You can also take advantage of special template-filled SQL window tabs when creating or altering objects: views, stored procedures, functions,triggers or events. On each of these actions (if called via the main menu, item Objects) a dedicated tab will appear providing a template for the selected object and action. The object's name will appear in the tab caption. 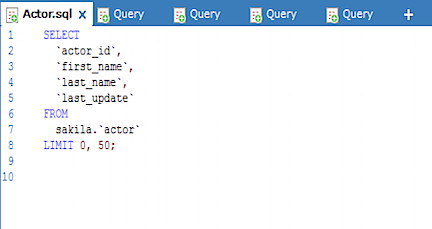 When there are multiple tabs in the ‘SQLyog Window’ that cannot fit in the default SQLyog window, then you can switch between the multiple connection tabs using the drop-down button at the extreme right of the tabbed interface of connections.